I remember my dad once bought one of those Salton home yogurt makers. He made a batch. It sucked. We never used it again. As a result, yogurt never played a huge roll in my upbringing. However, despite the all-out gluttony that we here at Foodists are known for, some of us do eat rather healthy, lower fat meals when not indulging. For me personally, I try to follow a diet that has a good balance of protein, carbs and fat. That’s tough to do come dessert time, but one grocery store item that works very well into that mix is Liberté Fat Free Greek yogurt. If you look at the nutritional information of most non-fat yogurts, they are usually low in protein and can also be quite high in carbohydrates (sugar). Greek yogurt is crafted using traditional methods: The yogurt is drained according to the principles of old-time cheesecloth draining, which gives it an incredibly rich and creamy texture and one that’s absolutely free of fat. The catch, for Liberté anyway, is it requires three times more milk than a regular yogurt. The result is twice the protein of any other regular yogurt, and therefore more nutritional value. All this is for naught if it tastes bad. Thankfully, Liberté has done a good job with that. When it first came to market there was a limited selection of flavours. In a move that I think helped them differentiate, rather than start with traditional flavours such as blueberry and strawberry, I first noticed Date & Fig and Honey flavours on the shelves. Kind of makes the Greek connection! While interesting, the Fig & Date flavour has a more pronounced chalky texture and mouthfeel that is a little unpleasant. The Vanilla and Honey are my favourites, and the fruit flavours are a quite good. There’s still a little residual chalkiness to it mind you, but it’s not so unpleasant as to steer you away from it. If you want to invent your own flavours, go for the plain version. It’s also a good a substitute for other plain yogurt and even sour cream in cooking. Will you love it as much as full fat yogurt? Probably not. Is it thicker than other no-fat yogurt, absolutely. In fact, you may even need to thin it with a little milk if you plan to use it with your morning muesli or granola. On the plus side, if you run out of spoons, you can eat it with a fork. Liberté has offered a $150 gift basket for one of our readers. It includes ten free 500g Liberté Greek yogurt coupons, bowls, diner napkins and a bamboo tray. We’ll draw one winner on March 17th, 2012. Ha! Enjoyed some Liberté Blueberry flavored Greek Yogourt for dessert tonight! Delish. 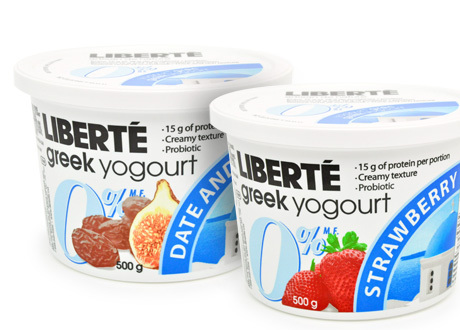 Congratulations to @avalen1, winner of our @libertecan Liberty Yogurt contest. Contact us with you deets and we’ll send it out! I used it as a starter for some home-made yogurt and it was awesome.